VA - "I Am Vengeance" (Soundtrack) / VA - "Scene Killer" / Solarized - "Driven"
Here's a strange one...a guy in Florida decides he wants to make a low-budget slasher movie, and then starts phoning up all his favorite stoner/doom bands to see if they'd be interested in contributing music for the soundtrack. Much to his surprise, most of them agree. 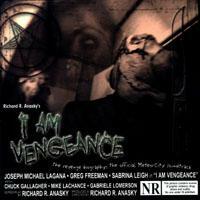 In the accompanying booklet for the 'I Am Vengeance' soundtrack, Richard Anasky goes through the story from beginning to exhausted end. Even after reading this text, I'm still a little confused as to what we have here. Anasky talks about how excited he was that one of his favorite bands Pentagram was going to do the title track, but yet on the disc this song is performed by Sweden's Lowrider. In the notes, it also points you to another 'I Am Vengeance' soundtrack on Game Two Records (maybe this is where Pentagram's version exists?). Most of the 75 minutes of music here is hard-drivin' stoner rock just as you can imagine. Which makes me wonder exactly how the actors had any time to do their dialogue, assuming such dialogue exists. There are a couple instances of voiceover bits and some incidental music contributed by Dan Fondelius (who plays in two of the bands heard here also, Doomsday Gouvernment and Count Raven) which make it seem more like a normal movie soundtrack. Naevus and The Quill, two bands that I like just fine, both contributed quality tracks. The very best piece of music here is Bongwater666's "Cannibal Love Song," a far more subtle (and yet more psychedelic) work with nice wah-guitar textures from Neddal Ayad. Canada's sHeavy is responsible for the album's lowpoint (not surprisingly), with vocalist Steve Hennessey eschewing his normal helium-induced Ozzy-voice for some other wacko falsetto singing that is hard to take. So that leaves Fondelius as the undisputed Ozzy-clone on this album! 'I Am Vengeance' is not a bad piece of work musically, and I can safely say I enjoy the music more than I would enjoy the movie! Horror flicks just ain't my thing, dontcha know. I list 'Scene Killer' under Various Artists above, which is true, but this hour-long stoner rock gem isn't a true compilation. Rather it's a semi-coherent multi-band project organized by James Hogan of Solarized, whose band and its spinoffs and relations are featured heavily on the recording. These are, I suppose, the obligatory East Coast sessions to answer Joshua (Tree) Homme's West Coast 'Desert Sessions' (now up to Vol. 8). (I hope this doesn't lead to any 'rap-style' turf wars!) Several sessions occurred between January, 1999 and ended in late 2000, featuring different combinations of folks, documented in great detail (journal style) within the pages of the booklet. Ed Mundell (of Monster Magnet) makes an appearance, whereas most of the other bands are far more obscure: Rotgut, Halfway to Gone, Daisycutter (we all know what that is now, don't we? ), and Burnout King. Some highlights include "Midnight Shack" - an instrumental, Troweresque psych-jam and (The Lemmings') Jim LaPointe's "You Know," a veritable laid-back jazzy affair. Chris Timms' "Found" is an echoey soulful ballad! More standard stoner tunes like "Pit of the Soul" and "Back of My Mind" help keep the overall pace up to minimum standard. Drag Pack, an extinct three-piece entity, contribute a pair of tunes including "Aurora," an amazing 10-minute gurgly-fuzz-guitar, acid-drenched, stoner dirge of epic proportions. This was a 'throw-in' track that wasn't really part of the recording sessions, but the track was apparently unreleased (left off a previous compilation due to space restrictions) and so it seemed appropriate to have it surface here. Damn good thing! 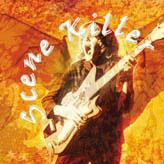 Not surprisingly, Scene Killer varies greatly from track-to-track, and is a very strong piece of work, appropriate for any lover of classic guitar rock, psychedelia, or heavy metal. Get this one first. 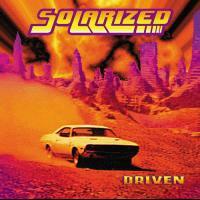 'Driven' is the one disc here that was produced by a single entity, the aforementioned Solarized. Recorded at the same Subterranean Studios as the Scene Killer sessions in New Jersey, 'Driven' is simply 40 minutes of raw power without attempting so much as a pretense towards sophistication. Well, the Fu Manchu/Nebula family have been building a career on exactly the same premise, and this effort is every bit as strong if you asked me. Guitarist/Vocalist James Hogan sticks to your typical stoner yell most of the time, but I'd take him over Eddie Glass (Nebula). Drummer Regina Satana (yep, a female) is solid and appropriately thunderous and machine-like, as is bassist Mike Fiore. "Chrome Shop" is for me the highlight of the album, nothing epic in scale or constitution but just a really fun, kickass number with an undeniable hook. This one is followed immediately by another strong tune in "Mean Spirit," something I remember from the Rise 13 compilation on Rise Above/TMC. "Stand Your Back" is a minor sidestep towards three-chord angst-punk, clocking in at just a single minute, and then "Firefight" continues in a similar grundgy vein. Not the album's strongest moment. Dave Topolenski's dirty slide guitar solo is the main notable feature of "Box Full of Dirt," and it goes for some time - the rare jam here. The finale "World Without End" is more reminiscent of Monster Magnet with Hogan a little more melodic here, notwithstanding the pounding, locomotive-style percussion. Overall, 'Driven' pulls no punches and comes off like an effective warmup performance that gets the crowd really excited for a headlining band with a little more depth and originality. Something like what we heard on Scene Killer, actually! Meteor City is on the web at http://www.meteorcity.com, while the mail order (All That's Heavy) resides over at http://www.stonerrock.com.